Bread pudding is one of those simple, homey desserts that cooks typically made with staples on hand: day-old bread, milk, sugar and eggs. Now that bread pudding is making a comeback on menus, chefs are sticking to the basic formula but adding a few of their own twists. Here, fresh mango brightens the appearance of the dish, while cinnamon, allspice and nutmeg warm up the flavor. 1. For bread pudding: Preheat oven to 350 F. In medium bowl, combine bread and mango; set aside. 2. In another bowl, whisk together half-and-half, egg substitute, granulated sugar, vanilla, cinnamon, allspice and nutmeg until well combined. Gradually whisk in melted butter. Pour mixture over bread and mango; gently fold until evenly coated. Let stand 30 minutes. 3. Lightly spray 12 6-ounce ramekins with nonstick spray. Portion 6 ounces of mixture into each ramekin. Bake 30 minutes or until tops spring back when tapped lightly. Cool. 4. For whipped cream: In medium bowl, whisk cream until it doubles in size and soft peaks form. Add vanilla and gently sprinkle in confectioners’ sugar, whisking until stiff peaks form. 5. 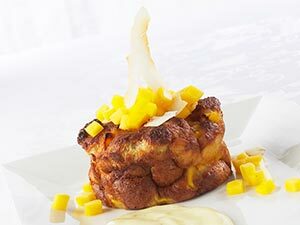 To serve, garnish cooled bread pudding with whipped cream. Sprinkle with cinnamon and finish with a fresh mint sprig.